Isn’t it amazing how facile we are at excusing ourselves when we want to hurt someone? If I preface my hurtful comment with an excuse, is it suddenly ok? We know that emotions are real – they are biochemical signals that affect every living cell in our bodies. Thanks to research on mirror neurons, we know our emotions even affect others. In fact, emotional pain and physical pain are essentially the same to our brains. 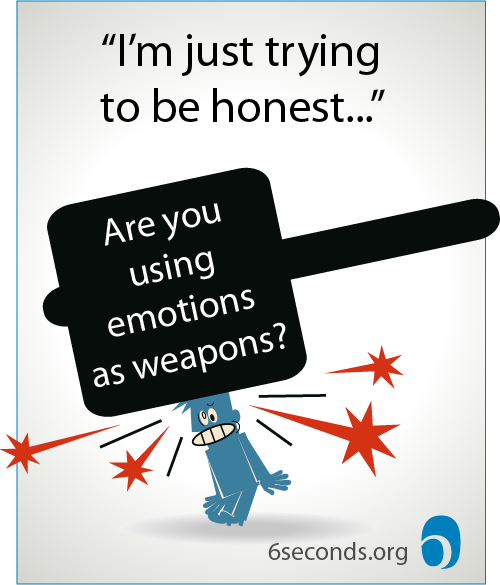 So next time you’re saying something hurtful, ask yourself: Am I using emotions as a weapon? How can we change? 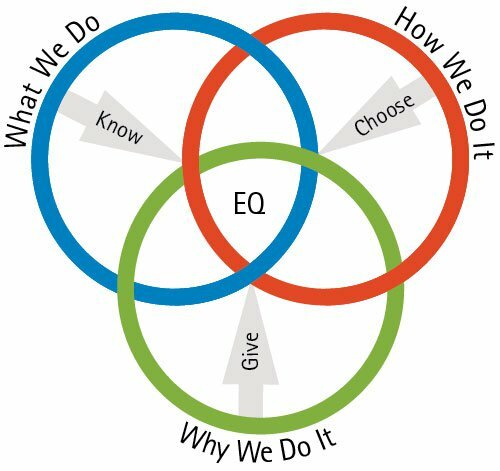 In the Six Seconds Model of Emotional Intelligence there are three key steps, or pursuits. Know Yourself is about being aware. Choose Yourself is about being intentional. Give Yourself is about being purposeful. Know Yourself: What are you feeling? How are you reacting? Choose Yourself: Do you have any other options? What effect do you want to have? Give Yourself: What’s truly important in this situation? Where do you want to go in the long term? Change Words or Change Intention? To go a step further, it’s not enough just to not SAY the mean words. In fact, the words are not the issue at all. Just think of the classic Southern matron saying, “Well bless her heart” – very lovely words, that usually meant, “I want to scream at this person.” Any words can be said in many ways – the question isn’t just what we do, but HOW we do it. 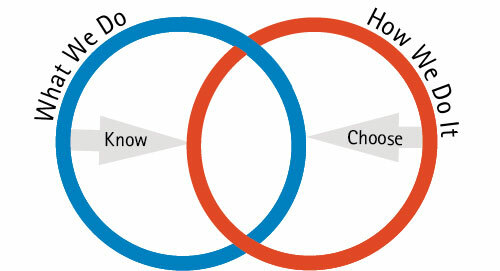 The Know Yourself and Choose Yourself parts of the Six Seconds Model are shown in this graphic. The question is: Do we have integrity between what we’re doing/saying and HOW we’re doing that? Remember, the question isn’t “what’s polite” – this isn’t a model of “being nice,” it’s a model of emotional intelligence: being smart with feelings. In other words, using emotional data to be more effective. As I wrote early this year, using a billiards tables as a metaphor, we need to pause an consider: Where do I want the ball to go? So what’s the impact we want to have on our colleagues, friends, employees, kids, etc? Our choices ARE having an effect, is it the one we want? A Step Further: Can I Stop Being Mean-Hearted? Recently I was honored and challenged by my daughter: We were talking about a teacher who is frequently inconsistent and inauthentic (probably because her self awareness is so low), and I said something mean. In a gossipy way, I was participating in the conversation. Dishing. Emma stopped the conversation, and in a sort-of-amused but sort-of-disturbed way said, “Whoa, Daddy you’re never mean about people.” While I’m proud that she has this perspective, and justly scolded for my behavior, the truth is she’s incorrect. I’m often judgmental and harsh – at least in my own head and heart. Many years ago I witnessed a brutal destruction of a beautiful community. I saw how easy it is to tear something down. At that point, I resolved to do a better job of watching my own words – but it’s not enough for me anymore. There’s a beautiful interview Oprah did with Brené Brown about Brown’s work on vulnerability and her commitment to wholehearted living. I love Brown’s work, her blend of authenticity and research. It’s about the courage to “step into the arena” of life – which requires vulnerability. Maybe we could make an excuse that being “mean hearted” is a small part of being whole-hearted… but it’s just an excuse. Really that “dishing” is just a form of self-protection. Of making myself better than others. If I’m going to truly be who I am, I’ve got to let go of that illusion of self-protection. This brings us to the third part of the Six Seconds Model. It’s easy to say, “Oh, I shouldn’t say mean things.” Harder to do. Harder still to say, “I want to stop being mean.” So why would we? If we don’t have a compelling reason, we won’t change. If we can align these three rings, we are putting our best selves forward. We have integrity between action and intention – and with purpose. We do the right things, in the right ways, for the right reasons. This reason I’m committed to practicing emotional intelligence is that it gives me a way to create integrity – alignment between who I am and who I mean to be. Here’s an interview with Dr. Candace Pert, former Chief of Brain Science at the National Institutes of Health. Dr. Marco Iacoboni is one of the preeminent researchers on the link between mirror neurons and emotion. Here’s a report of a meeting we had with Dr. Iacoboni, and a link to his website. There have been numerous studies of this phenomenon, one of the pioneers was a 2004 fMRI study by Eisenberger et al, showing that the same brain areas are implicated in both physical pain and emotional hurt. Here’s a link to a summary at the Brain Institute at the Oregon Health & Science University. This overview explains The Six Seconds Model of Emotional Intelligence – the three pursuits and eight specific competencies. Oprah.com Connections: The Wholehearted Life: Oprah Talks to Brené Brown (2013). I have found finding a mission that aligns with kindness an essential tool in making emotionally fit tools. Kindness can be deconstructed in many ways, but most of us know what feels kind versus what feels mean. If we then add a bit of thought, we choose more wisely. Hi Katherine – absolutely! In the Six Seconds Model, we have that capstone competency: Pursue Noble Goals. It’s about aligning our daily choices with long term vision. Where do we REALLY want to go? If that vision is grounded in respect and connectedness, then it gives us the mandate to view our daily choices through that lens of compassion. As a side-line to this intriguing topic, I remember the classic TV-series, Carol Burnett show. The characters who portrayed MOMMA’S FAMILY who each portrayed their-own niche into their character. – There are times when situations deem these traits to help remedy the situation at hand. Maybe not Emotionally-effective, they did remedy the situation. My, how The Entertainment Industry effects our lives! To align those three rings, and put our best selves forward needs just a momentary thought processing but it is possible only when we live with higher disciples of EQ mentors around us. A progressive environment of EQ is very important. I believe EQ is really a cohesive teamwork. Thank you so much. Hi Zerqa, I agree that environment – culture – context – role models – have a profound effect on our ability to be and do our best. In a recent webinar with Six Seconds, Annie Murphy Paul shared fascinating research that our intelligence (IQ side) is actually social — it’s shaped and changed by our social context. Of course the same should be true, maybe even more true, with emotional intelligence. People are wired as social beings, and that context changes our brains. This is a well-crafted insight into what we do and say to others. I agree with it. However, it prompts the question, how does this model really work out? I’m curious, for example, how this approach works in the context of genuinely of destructive behavior patterns. The teacher you mention above could, for example, reject any input you offer – no matter how genuine, well-intended and positively purposed. She could reject any dialog or input and consider such feedback as hurtful – regardless of how it is delivered. I think your approach is good. I believer it is right. But it needs wheels. Hi Mark – thanks for the comment. In the Six Seconds Model, you’ll notice a common thread: Yourself. We believe that change starts on the inside. So if that teacher is rejecting input, it means I need to change… because I can’t change her. What’s fascinating is that when we each take full ownership of our side of the story, others change. Maybe not exactly as we envision, but when we change our side of the equation, the other side is catalyzed and something unfolds. Thanks Josh, this is a great article on deep accountability to self and others. Helps me check in with my noble goal. I think it is also important to provide honest feedback. A true friend won’t let you drive drunk or go blindly about making a fool of yourself. I think parents, in particular, feel unable to criticize. So the trick is to say what needs to be said, but in a way that can be heard. One can even get a bit angry upon occasion – necessary with some kids. The trick is to repair the relationship if the feedback or anger seem to have done damage. Would love to hear some ideas for doing that. It is really good to hear sensible, caring advice deriving from good theory. Emotional management and kindness seems to have been sacrificed over the years to self expression and indulgence. Thank you for a great article which I shall be sharing with my groups. Thank you Renee – I certainly think there’s value in self-expression… and, there’s that great quote, “the right to swing your fist ends where the other mans nose begins” (maybe Supreme Court Justice Oliver Wendell Holmes?) — given the research on emotional pain being REAL, maybe we need to consider where others’ “emotional noses begin” and stop swinging our fists around so much? Not just kindness, but integrity to live in balance with others. I always appreciate your insights. I am a person with low EQ chemistry who has been trying to teach high EQ skills for twenty plus years now. I find it most difficult when dealing with boards. Dan Ariely’s research demonstrated that “altruistic intent” increases dishonesty. I also find it excuses emotional abuse. We just returned from the 15th nonprofit conference we’ve produced. What is it about boards that make people feel they are entitled to be abusive to staff? Hi Randy – ouch. Yes. Because Six Seconds is a nonprofit, we’ve worked with a lot of nonprofits on their organizational development — we measure organizational climate, with trust as the central factor. Unfortunately, I’ve seen many orgs with beautiful visions, and often doing truly remarkable work in the world, and not doing the work internally. I am not familiar with this research of Ariely’s, but it sounds right on to me: We excuse our own bad behavior because we see ourselves as ‘doing good’… I am a huge fan of Gandhi’s work on Satyagraha: There is no difference between means and ends. Mike McMahon .UK . Hello to you all, and thanks for your many illuminating comments and observations. Just love Rick’s comment a succinct point wonderfully made. Can I connect with advisers On EQ training -counselling in The UK . London or SE England, Brighton. Hi Mike – welcome! If you head over to http://6seconds.org/connect you’ll see links to our Regional Network Directors — Kim will be glad to help connect you to others in UK & EU! Honestly, I must say, at 60 Years old, I am learning something I have not known. But its never too late as the saying goes, Learning stops at death. EQ is a starter for the better in life before death. I will learn as much to educate my family first and go out to help others. I am doing a Ph.D. in emotional literacy, and am particularly interested in focusing on the emotional integrity of the individual. I want to explore emotions on an intrapersonal level. Are you aware of any research that differentiates literacy/ intelligence, from the integrity aspect? Hi Rhonda – tell me more! It sounds interesting. So for example, if someone is intentionally manipulating others feelings it could be they have high literacy and low integrity? In our model, we have a competency called Pursue Noble Goals, and one reason is that we want EQ to be used ethically. It could be interesting to explore in our database cases where this does and does not correlate with emotional literacy.